Lost Track by Raoul Kramer is an in-depth journey along the Burma-Thailand Railway. Through exploring the railway’s historical significance as a product of the people and prisoners forced into labor by the Japanese Army, Lost Track takes the viewer through a harrowing past largely forgotten in the present day. While approached primarily as a documentary body of work, the innovative design incorporates archival material and text with at times haunting imagery, bringing forth a staggering conceptual series. 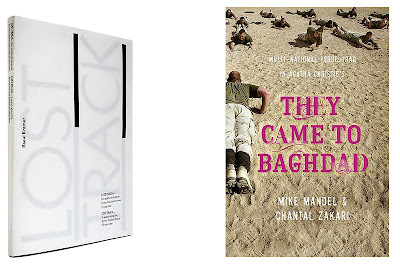 In their new collaborative book project Multi-National Force: Iraq, in Agatha Christie's They Came to Baghdad, Mike Mandel and Chantal Zakari take an innovative look at diplomatic and romantic notions of the city plagued by seemingly endless conflict. Paralled with the visual imagery of the covers from Christie’s hugely popular book, They Came to Baghdad, the artists combine found web imagery from sources such as the New York Times, Flickr, Wikipedia, and more to explore ideas of international intrigue. Mandel and Zakari have taped into the many voices that are now involved in shaping, reconstructing and portraying Iraq.